A dragon and a human fall in love in this incredible fantasy tinged with symbolism. In a mythical kingdom, passionate love between a young man and a female dragon transcends the ordinary romantic fling. Enter an incredible fantasy that defies even magic in Alex Gordon’s Emerald, a story that takes place in a medieval-style realm teetering on the brink of disaster after an exhausting war. Akron is a gifted man with the special ability to heal sick and wounded dragons. A nurturing soul and a gentle companion, he holds Emerald close to his heart, and they become inseparable. She is his soul mate, his loyal protector, and his closest friend. Their touching interaction is reminiscent of committed teenagers, a reciprocal relationship that no one dares to cross even though it is frowned on by the harsh society in which they live. Emerald wakes up (with her paw on Akron’s chest) to the last light of a dying fire and stretches out and kneads the pillow with her claws. She looks to see if daylight has come. But she realises she and Akron are underground. Emerald leans over her slumbering human … her warm, soft, smooth under-scales caress a small patch of Akron’s bare skin. He stirs awake and tickles Emerald’s neck. The gradual manifestation of this couple’s unique attraction is fascinating, but a deficiency of both content editing and copyediting detracts from what could have been an outstanding novel with a tender message of compassion. Hasty production methods often lead to a loss of quality, regardless of the viability of the story, and this intriguing plot is yet another example. Meticulous scrutiny before publication would have benefited this book tremendously. The concept is quite appropriate for a young-adult crowd that gravitates toward fantasy tinged with symbolism. Every scene is subject to interpretation, even though the majority will likely take these situations at face value. Gordon brings all senses into play—foul odors, teeth-grinding pain, gruesome sights, grating sounds, unpleasant flavors—a mark of keen observation. Alex Gordon is a native of Australia and a self-taught writer. His passionate characters reflect stamina and strength. 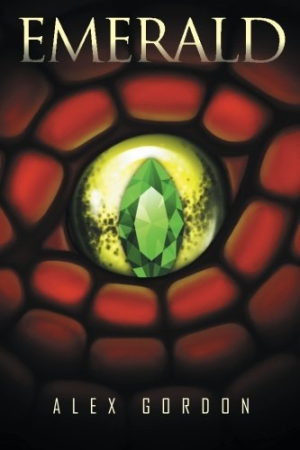 Emerald will delight fans of mystical kingdoms where fantastical creatures take on distinctive personalities, lending a unique voice to the narrative.